May is Asian Pacific American Heritage Month, and ECAASU is highlighting movers and shakers today striving to foster change within the Asian American community. 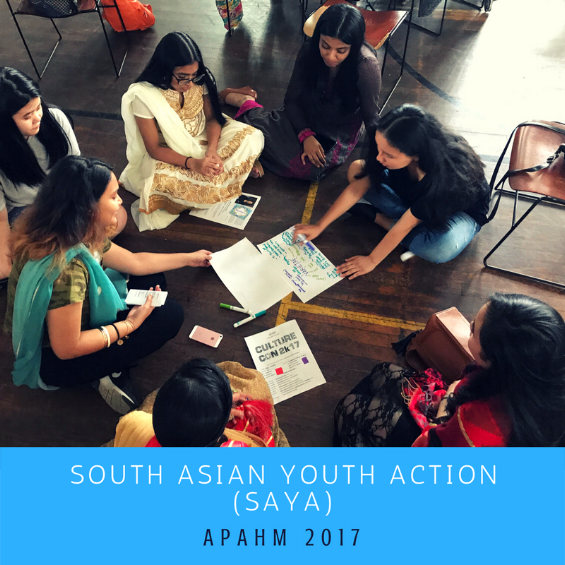 We're asking the South Asian Youth Action (SAYA) in New York City why they think community building is important for AAPI youth and how they celebrate APAHM. Tell us about yourself and the group you're representing. My name is Sarah Rashid and I run the Young Women's Leadership Program at South Asian Youth Action (SAYA). SAYA is a 501(c)3 youth development organization in New York City for students in elementary school through college. Established in 1996, SAYA has grown into a $3.9 million organization currently running programs at nine NYC schools, our community center in Elmhurst, Queens, and a library in Kensington, Brooklyn. Our holistic and comprehensive programming includes free leadership and identity development, academic support, college preparation, career exploration, sports, arts and STEM instruction. While South Asian-focused, SAYA is secular, inclusive and committed to connecting youth from all backgrounds to opportunities. Can you talk about the mission of SAYA and what you advocate? SAYA's mission is to foster a strong sense of belonging in youth and provide them with the tools to thrive academically, professionally and personally. Specifically in our leadership and identity development work, we advocate self-awareness, social awareness and empowerment. We develop social and emotional intelligence through team building, critical thinking and socially engaging projects. Why do you think community building is important for South Asian youth? I think that community building is important for everyone, however they identify. Within various cultural and ethnic groups, including South Asian communities, there tend to be certain norms and expectations. Therefore, I think it's important to cultivate spaces among these communities where sensitive issues can be addressed, assumptions can be challenged, and people can feel free to be their authentic selves. From there, youth can develop the confidence to make healthy decisions for themselves and actively engage with the wider world. What's your favorite part about working with youth? There's never a dull moment! I wake up everyday excited to go to work because I am so inspired by our youth. They are so eager and passionate, and I love challenging myself to find new ways to cultivate and direct their energies toward issues they care about. I am grateful for the opportunity to be the kind of mentor for our youth that I wish I had when I was their age. In a country as culturally diverse as America, we are constantly aware of our cultural identities. For minorities such as AAPI, that awareness can be exhausting and at times, disheartening. It's important for us to speak openly and connect with each other regarding our collective challenges so that we can share our burdens and help each other thrive. This includes celebrating our heritages, deepening our knowledge about our histories, and sharing our experiences with the wider society. Every year we have an annual Young Women's Leadership Conference. This year for the first time, the youth organized and ran the show, and they happened to choose the perfect theme for a conference during APAHM: Cultural exploration, expression and empowerment. For two months we prepared workshops and activities for our participants that would guide them in exploring the intersecting cultural identities with which they identify, expressing pride in their cultures in the face of difficult political times, and empowering them to define their own communities and be voices of positive social change. What’s one piece of advice you would give to AAPI students and young professionals striving to more socially conscious? I would advise them to join or create a community culture of AAPI students and professionals who are also striving to become more socially conscious. The pressure in many AAPI communities to enter certain fields and achieve a certain standard of living is so strong, that it's difficult not to get swept up in it. We need to create new, alternative cultures that prioritize social justice and that can validate and support those who want to go down non-traditional paths. My transition from the corporate world to non-profit work closely corresponded with my social shift from being around mostly status-conscious people to being around mostly socially-conscious people. These are not mutually exclusive groups, but the latter inspired me to imagine a different life for myself and facilitated my leap into a new career that I find more fulfilling. Where can keep up with your work? You can keep up with SAYA on our website, www.saya.org, where we have an active blog to which our youth contribute. You can also follow us on social media: Facebook @southasianyouthaction, Instagram @saya.nyc and Twitter @sayanyc.